Pramoedya Ananta Toer, who died in 2006, was arguably Indonesia's greatest writer and one of the world's most engaging novelists. I don't feel like I am reading his works as much as wrapping myself in them. I named one of my children after a character in Bumi Manusia (This Earth of Mankind). Following the 1965 coup that saw Suharto take power, Pram was imprisoned for decades, much of that time on Buru Island. Exile is an account of conversations with Pram not long before his death. The topics run from politics to literature to Indonesian and Javanese culture. Pram's pain and disappointment at the course of Indonesia's development is obvious in his cutting reflections on culture, government corruption, and the dominance of the US. He rightly lays a great deal of blame for Indonesia's ills on the Suharto regime - understandable given the years of imprisonment he suffered at Suharto's hands, as well as the very real corruption and misgovernance that characterized the New Order, particularly in the final few years. I found his reflections on culture and his view that the Javanese propensity to submit to authority figures shackles Indonesia's development fascinating. He is clearly a fan of Sukarno - time and distance allow him to ignore or gloss over Sukarno's profound failings in the later years of his presidency. All was well, in Pram's view, before the coup, and if Sukarno had been allowed to continue Indonesia would have proceeded to a bright future. Exile is a valuable complement to his other published works. It's not as compelling as the Mute's Soliloquy, his account of imprisonment on Buru and elsewhere, and these conversations sadly reveal far more unhappiness and far less hope about his homeland than I expected. For all the faults he describes, Indonesia has made a relatively peaceful transition from authoritarian rule to democracy, vacated East Timor, and avoided the large scale sectarian bloodbaths that have claimed other nations at a similar stage of development. Terrorism seems to have been brought to heel and the world's largest muslim nation remains a reliable U.S. partner. Civil society continues to roll, sometimes lurch, along and renew with every turn of the monsoon. I guess Pram remained an exile until the end. I was pleased to see the current National geographic features an essay by David Quammen on Alfred Russel Wallace, the (relatively)unsung hero of evolutionary theory. A young man of modest means pursuing his interest in natural history and finding a path to the origin of species independent of Darwin. His paper spurred Darwin to publish his long incubating treatise on natural selection, and changed the world. That man was Alfred Russel Wallace, a young English naturalist who did fieldwork throughout the Malay Archipelago in the late 1850s and early '60s. What you won't see on Ternate is any grand plaque or statue commemorating Wallace's place in scientific history or the fact that, from this little island, on March 9, 1858, he sent off a highly consequential letter, aboard a Dutch mail steamer headed westward. The letter was addressed to Mr. Charles Darwin. Along with it Wallace enclosed a brief paper titled "On the Tendency of Varieties to depart indefinitely from the Original Type." It was the product of two nights' hasty scribbling, which followed a moment's epiphany during a fever, which in turn followed more than ten years of speculation and careful research. What the paper described was a theory of evolution (though not under that name) by natural selection (not using that phrase) remarkably similar to the theory that Darwin himself, then an eminent naturalist of rather conventional reputation, had developed but hadn't yet published. It's starting to look alarmingly like the pursuit of biofuels will be the next poster child for the Law of Unintended Consequences - up there with thalidomide and turning cattle into cannibals. Borneo's forests have been under siege for some time by the agricultural industry, transmigrants, and the mining industry. Demands for "environmentally friendly" energy might just drive the last chainsaw to the last tree. I'm starting to think these guys have a point. ...Palm oil plantations have long been a staple of the economies of tropical Indonesia and neighboring Malaysia. Oil made from the red, spiky apple-sized fruit is used to make a vast range of products, from soap to chocolate to lipstick. But concern over pollution from the burning of fossil fuels in Europe and the United States has led to a new use for the oil - mixing it with diesel to make a cleaner burning and cheaper fuel to put in cars. The EU parliament this year announced a renewed push to meet sustainable energy targets, including mandating using biofuels to supply at least 10 percent of transport fuel needs by 2020. Encouraged by government tax breaks, many of Indonesia's largest conglomerates as well as foreign companies are investing millions in expanding plantations and refining facilities on Borneo, which has one of the richest ecosystems in the world and is one of the only remaining homes of the orangutans. A State of Emergency is being called for in Bandung, West Java. 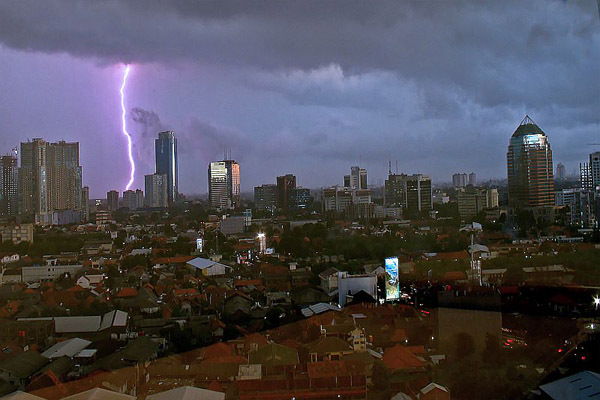 What disaster is plaguing Indonesia this time? Earthquake? Volcano? Tsunami? Flood? Terrorist attack? Avian flu? A State of Emergency needs to be declared in Bandung, because of prostitution. The Bandung Sin Watch (Bandung Maksiat Watch (BMW)) association, which is an umbrella organisation for a number of Islamic groups including Majelis Mujahidin, Pemuda Muhammadiyah, and Tim Pengacara Muslim, and is led by Asep Syarifudin of the Front Pembela Islam (see Headscarf Ban), has called on the Bandung city government in West Java to declare a Prostitution Emergency over the rampant practice of prostitution there. Wonder if the Red Cross will get involved. Link: Prostitution Emergency | Indonesia Matters. MANADO, Indonesia (Reuters) -- An Indonesian court has cleared the local unit of Newmont Mining and the unit's American president of all charges in a high-profile pollution trial, the chief judge said on Tuesday. The case has been seen as a key test of attitudes towards foreign firms and environmental protection in the country. "Pollution charges against Newmont Minahasa Raya and Richard Ness cannot be proven," chief judge Ridwan Damanik told the court, referring to the local unit of the U.S. firm and its president. "They are being relieved from their primary charges, and since the primary charges cannot be proven, other charges cannot be considered," he added. Analysts had said a defeat for Newmont would have deterred investors from putting their money in the mining sector, which has not seen fresh investment for years. But the verdict will be viewed as a defeat for some activists who wanted to send a message that Indonesia is serious about enforcing laws to protect the country's rapidly degrading environment. The company had been accused of releasing toxic substances into a bay near its now-defunct gold mine in North Sulawesi, making villagers sick. In November, the prosecutor asked for Ness to receive a three-year jail term and a 500 million rupiah ($55,000) fine, and the company to be fined 1 billion rupiah. The maximum sentence Ness could have faced under Indonesian law was 10 years. Newmont and Ness had denied the charges, pointing to studies that found no evidence of pollution. The U.S. company said last month it might reconsider its investments in Indonesia if its executive was found guilty. Indonesia has some of the world's largest deposits of gold, tin, nickel and copper, and some of the world's top mining firms such as Freeport-McMoran Copper&Gold and PT International Nickel Indonesia have operations in the country. An Australian athlete plans to paddle a surfboard across one of the world's busiest shipping lanes this weekend to raise aid money for remote Indonesian villages. Jackson English, 31, of Avoca Beach in New South Wales state, believes he would be the first person to "paddleboard" from Singapore to Indonesia's Batam island and back, a total of 80 kilometers. He was scheduled to leave Singapore on Saturday morning and return Sunday. English said by phone he hopes his feat will raise about US$300,000 in donation pledges. He said the money the humanitarian organization SurfAid International will use the money for a boat to haul supplies and aid staff to remote villages on Indonesia's Mentawai Islands off Sumatra. This is a great cause and I wish him well, but 50,000 ships - big ships - a year (that's 137/day) pass through the Strait of Malacca. I hope he's a fast paddler. Speaking of Indonesia, the Jakarta Post describes tomorrow's Nyepi holiday (Day of Silence) in Bali. Despite frequent travel to the island I was never there during Nyepi. Bali is a special place and its flavour of Hindusim is distinct. The resort island of Bali will be temporarily closed for 24 hours as of Monday morning at 6 a.m. through to the same time Tuesday to observe Nyepi (the Hindu Day of Silence). ...During the ritual of Nyepi, 90 percent of the island's 3.5 million inhabitants will practice Yoga Semedi and Catur Berata Penyepian (meditation), Amati Geni (which forbids them from lighting fires and switching on lights), Amati Karya (working), Amati Lelanguan (enjoying leisure activities) and Amati Lelungan (leaving their houses). In the two-plus years since an estimated 160,000 Indonesians were killed in the 2004 tsunami, thousands more have died in earthquakes, hundreds have perished in landslides and floods and hundreds more in plane crashes and ferry accidents. There have been three aircraft accidents involving Boeing 737s since New Year's Day. Infact, more people died in disasters in Indonesia than in any other country last year. And as if to add insult to injury, the environment ministry says 2,000 of the archipelago's 17,000 islands could disappearing under rising sea levels caused by climate change over the next 25 years. The most interesting speaker was Debby Guha-Sapir, the director of the Centre for Research on the Epidemiology of Disasters at the University of Leuven in Brussels, Belgium. She correctly laid a fair amount of blame at the feet of corrupt government officials' failures to avoid and / or mitigate many of these catastrophes. The second segment dealt with the battle over creationism in science classrooms in Turkey, and touched on how Muslim and Christian fundamentalists are finding common cause in their desire to push back the Enlightenment. Now THAT was high quality radio. The audio can be reached by clicking through the link above.